here are so many screenwriting books out there that claim to be the best, so how do you know which ones to buy? Today we’re going to go through what I think are the very best screenwriting books. We’ll help you discover how each screenwriting book can help you break your story and open new doors in your career. Some people do a top ten screenwriting books list. We went with fifteen. These books are the sort of resources that writers at all stages of the process, and in all stages of their career turn when they need a little insight. So come with me if you want to write! This is easily one of the most famous, and flat out best, books on screenwriting. Blake Snyder’s book effectively breaks down the genres, and the beats that every good script should follow. It creates a screenplay template that helps writers drag and drop ideas. We have a whole post dedicated to the Blake Snyder’s Beat Sheet. It'll help you download a template so you can fill in the steps on the beat sheet yourself. It’s great tool if you’re trying to outline your idea and have no idea how you want to order the story events. Already have a solid outline and want to spice up what’s on the page? As you get better at writing you can use his beats and subvert them to surprise the audience. Mix and mash the genres to keep things exciting and new. An additional nice thing about Save The Cat is that the mission did not end with the book. The website is extremely active and still uses the beat sheet to break down popular films. This one is certainly in my “best screenplay writing book” rankings. They call it “The last screenwriting book you’ll ever need” but we think the next 14 are just as valuable for different reasons. Trust us, young screenwriter, we wrote the blog on the best screenwriting books! Producers, studio executives and talent representatives read Save the Cat more than they read any other screenwriting book, because it features an almost foolproof beat sheet that was informed by film financiers. If you’ve finished your script, but can’t sell it, read Save the Cat. This is the book your screenwriting heroes probably read when it came out. It was first published in 1979 and has accolades from multiple generations of writers. The immediate benefit of this book is that it set the standard for all books that came after it. The title says it all. There are no frills in Screenplay. It’s the basic manual. The entire book is dedicated to getting you to do and sell your best work. If you’re looking for the barebones guide to the screenplay this book is for you. The book spends time making you understand why the first ten pages are crucial, how to write visually, and even takes on how to approach an adaptation. It's an all-encompassing work that’s as relevant today as when it first came out. Great storytelling advice never changes. This is the stand-by. The meat and potatoes, if you will. People have been telling stories for thousands of years. From ancient myths all the way to the modern web series. This book tracks that progress, and specfically how ancient mythology has an effect on present day movies and television. It emphasizes the classic tropes that have worked for ages and pushes a deeper analysis of The Hero with A Thousand Faces as it relates to our society today. What sets this book apart from the other is that it keeps it all feeling very personal. Like someone is rooting for you. This is the screenwriting book that will help you grown and develop as a person. It makes you analyze the people in your life and how you’ll react to certain situations. You’ll also find yourself classifying your friends into certain archetypes and figuring out where they are on their particular journeys. It’s called “The Writer’s Journey,” but it’s truly one of the best books on filmmaking as well. It's a MUST on the screenwriters bookshelf. Lew Hunter bills this book as “The Industry's Premier Teacher Reveals the Secrets of the Successful Screenplay” and he’s not wrong. In 1998 nine out of ten of the top grossing movies were written by a Lew Hunter student. Take a second and let that sink in. Now that it’s sunk in, I have to admit something. I tried to fact check this claim and didn’t come up with anything conclusive, so don’t report me to Reddit Screenwriting. Actually... maybe head over to reddit screenwriting and see if anyone has an answer! Then comment on this post if you can vouch for that stat! The benefit to this book is very clear. Not everyone can travel back in time to take Lew’s class or go to UCLA. But reading this book is like being in his lecture hall and taking notes. Reap all the benefits, and don't accrue that student debt! This book is a “must have” for every screenwriter. It's the very first book I bought when I took my first film class in college. 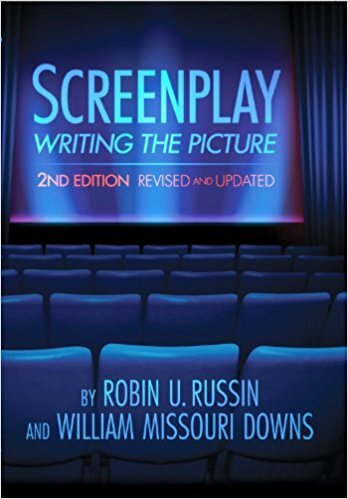 It is considered required reading for anyone who wants to learn the nuts and bolts of how to write a screenplay. The greatest feeling in the world is hitting a stride while writing. You don’t want anyone to interrupt you. You just want to roll. Well, what do you do when you have a question about how to format something on the page? Do you let it derail you and your flow? Grab this book and have it handy. A quick flip to the index will show you how to format a phone call, denote a montage, or even use “dual dialogue” to show two characters arguing. I still have it on my desk today and use it any time I have a question. It makes you look like a professional on the page. That’s important aspect of beating the reader. For my money, this is the quintessential guide for anyone starting out and has become my reference manual as I continue my journey as a writer. Ranks easily in my “Best Screenplay Writing Book” list. Writing Movies for Fun and Profit is a charming and humorous take on writing that’s focused on one thing… movies that make money. It’s a great tool for filmmakers and is one of the best screenwriting books. Best Screenwriting book for beginners? Best Screenwriting book for advanced? This one has it all. This book is as much entertainment as it is a serious educational tool. You’ll feel more confident writing scripts, performing pitch meetings, taking notes, and even living in LA after reading this book. One of the big things this screenwriting book touches on is the ability to take notes on your script. You need to develop a thick skin as a professional screenwriter, and the best way to receive notes from collaborators is with some grace. Have some tact. Then cash your check. You want to learn how to write a screenplay? These guys are masters. This isn’t a boring screenplay format book. It’s about getting that money. They are WORKING writers. With credits for movies you’ve seen. What sets this book apart from the others is that all the advice is practical. It’s stuff these two wish they knew when they started. It would also rank on a “Best Books on Filmmaking” list for all its insights into the studio system. It’s definitely for those a little further along in their careers, though it does contain advice on getting representation. Once you have reps you may think the battle is over, but it’s actually just the start of the war. There isn't another book out there that answers questions about how to behave and deal with your reps.
And you'll have so many times where you'll need help figuring out how to deal with your reps. Good problems to have, sure. But problems none-the-less. Gervich also comments on things other books don't like the internet, personal branding, and the state of Hollywood in the digital era. This is a must own as you get deeper into your career. Ari wants to read your screenplay, baby. If the idea of crafting a 120 page screenplay feels daunting to you then this is the book for you. It will help you focus on, and nail, writing a short film. This book not only tells you how to write short films, but is written in a conversational style that makes it's techniques much easier to absorb quickly. We’re talking about Whiplash, Mama, District 9, and Cashback. Right now, one way lots of filmmakers are breaking is to shoot the short first. While other books never touch on short films, this one makes it the focus of the entire work. Writing short films can be useful at any stage of your career. There’s even an Academy Awards section dedicated to it. And thousands of festivals built around writing short films. But the main benefit of this book is an exercise called The Le Menu. Absolutely in my “Best Screenplay Writing Book” top five. Don’t believe us? Try yourself! If you’re interested in conquering how to write short films or just poaching some of the great ideas and exercises in here for your features, this is the perfect book for you. You want to be a writer because you have something to say. This is the book that takes that seriously. This book is technically about playwriting but since Mamet crossed over into movies and straddles both worlds we’ve got to count it. 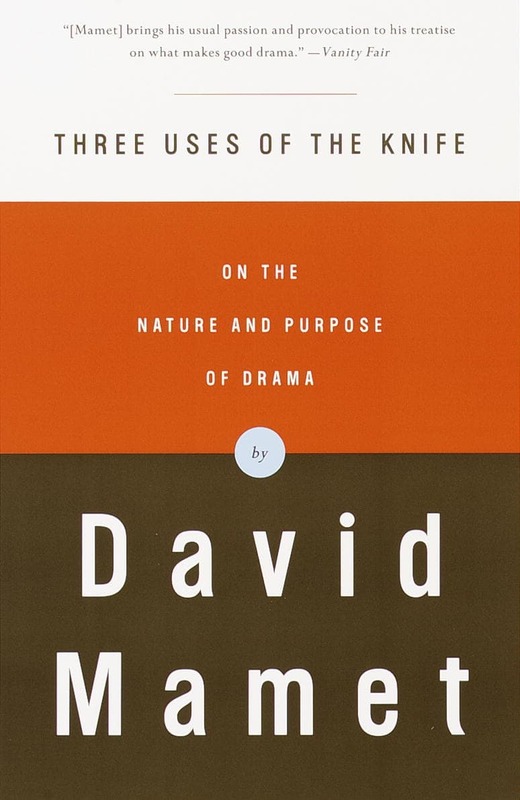 Mamet’s book is dead set on making sure you know that writing drama is essential for a human experience. What sets this book apart from the rest is that it comes at writing from a purely magical angle. It’s not about selling out or entertaining, but about leaving behind something that matters to the audience. Your story matters. This book makes you believe it. This is almost more philosophy than craft, but can help get you out of your own head when it comes to writing and remind you why the stories you have to tell are so important. David Mamet has a lot to say to Screenwriters. The veritable bible according to most aspiring and even most accomplished screenwriters. McKee made his name from his incredibly expensive screenwriting classes and lectures. If you have $597 to spare they come highly recommended. That’s almost twice what it would cost to by every screenplay writing book on this list. If you’re on a budget, it might be better to just read the book. The book is thicker than an encyclopedia and works to tie the magic of the process and the practicality of structure together all at once. McKee lists his famous clientele openly. Quincy Jones, Diane Keaton, Gloria Steinem, Julia Roberts, John Cleese and David Bowie all have used him as a consultant or taken his courses. The book can be an arduous read but the advice is practical and actionable. McKee focuses on writers using notecards to outline scenes before putting them on the page. At the same time he helps you get at the more ethereal ideas behind writing. Story forces you to travel inside to write things on the outside. It’s a helluva trip. There’s a reason they spend a few scenes lampooning McKee in Charlie Kaufman's Adaptation. Stephen King takes us through his process in this first person memoir that’s part instructional manual, part diary. It’s also one of the best books on creative writing. King walks us through his career, from his early struggles being unpublished, to his near fatal car accident in 1999. Instead of the textbook like approach of other entries on this list, this book is written to be enjoyed. King’s voice sings off the page and he lets you revel in his self-deprecating humor and easily identifiable problems as he sits down to write. As we know, writing is hard. If you’re trying to procrastinate, or just want to know that even the greats struggle, then this is the book for you. Joseph Campbell aims to prove him right, by analyzing all the tropes and mythos that goes into storytelling. This is the oldest book on the list, first published in 1949. Chapters in this book include the Cosmogonic Cycle, the mythic pattern of world creation and destruction, and The Transformations of the Hero. The benefit of this book is that it comes at story from a very scientific point of view. Sometimes that makes it easier to figure out your character and plot. Jaqen H'ghar is a literal hero with a thousand faces. Campbell dives very deep into the ways stories have been told, the journeys heroes have gone through, and how they’re all related across all cultures and all times. This is definitely the most verbose book on this list but it's also one of the best books on creative writing and the history behind the process of telling stories. It's a deep dive to be sure, but you'll come away from it as an expert on story. And that's pretty useful if you want to become a great screenwriter. And if you want more insight into how to apply this masterwork to your writing, check out our breakdown of Campbell’s Heroes Journey. I mean, does it get any better than one of our most treasured Writer/Directors interviewing another one of our most treasured Writer/Directors about the craft? There’s many similar books in this series (Hitchcock/Truffaut remains a standout) but this is the best one about writing. The book is a complete breakdown of Wilder’s famous films. The Apartment, Sunset Blvd, Double Indemnity, Stalag 17, and Some Like It Hot. Wilder wrote and directed across every genre in a time when few writer/directors could do that. He pulled it off every time, and is easily one of the greatest, and most versatile, storytellers the big screen has ever known. These two men have very different styles but dig deep into the craft of writing, working with talent, and getting notes from studios. Lots of screenplay books are written by people who failed. These two are in the Hall of Fame. It's the final book in my “Best Screenplay Writing Book” top 5. The book is full of pictures and insider knowledge about Hollywood and the process. Before we get into this book I want you to take a second to check out the author’s names. Honestly, they’re two of the best names on the entire planet. Missouri! Amazing! Okay, fine, back to the content. The reason I love this book is that it covers the WHOLE journey. From inception, to outline, to first draft, polish, pitching, and selling. Lots of books on this list specify one thing. But this book is a one-stop-shop.Also, in order to stay relevant, Russin and Downs update their work every few years. Do you have any screenwriting quirks? Write in the tub? While smoking? They’ve stayed on Hollywood trends and they address the rise of digital media and video games as viable writing careers. The book is full of examples and practical tools for writers at any stage. William Goldman gives us a look into the life of a Hollywood screenwriter, and entertains along the way. This book demystifies the film business, and gives some insight on how they work behind closed doors, and what it is like to work with legendary filmmakers all told to you by a legendary screenwriter. 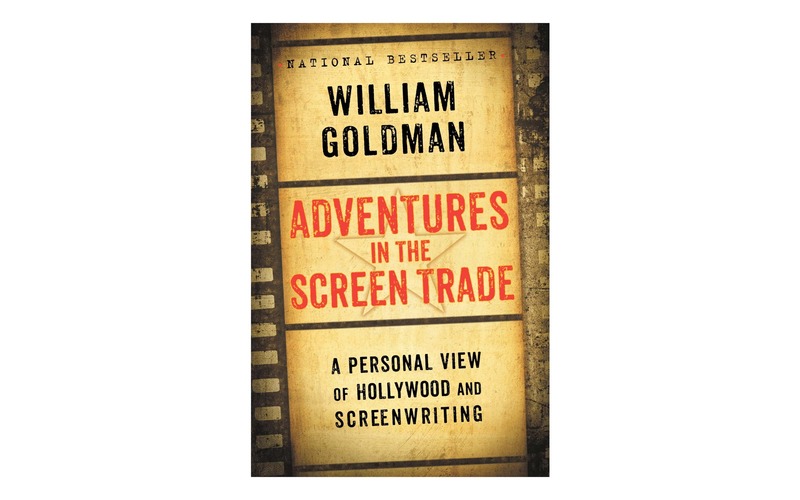 Adventures in the Screen Trade also takes you into Goldman's own creative process for screenwriting, and some of his classic tips and tricks. Many of the screenwriting lessons consider "standard" at your expensive film school were found and regurgitated from this book. We live in a digital era where information is mere clicks away. If you made it this far you must be really serious about taking your writing to the next level. Pick your favorite movies. Pick movies you hate. Read them all and learn from the page. Examine how the great writers format their action, write their slugs, and create their dialogue. And take a peek at some of the terrible ones. Do better. There are plenty of resources for you in this area, with the best one being the Writers’ Guild Of America, which publishes lists of the best scripts as well as plenty of resources for you to use as you continue your journey as a writer. Check out the Internet Script Database and No Film School for ways to read for free. So there you have it. The best books on screenwriting. After you’re done reading them, it’s time to get to work on your masterpiece. But what if you’re still stuck? This isn’t the end. Brushing up on the details of plot structure keep them fresh in your mind and keep your pages turnable! Check out THE ASPIRING SCREENWRITER’S DIRTY LOWDOWN GUIDE TO FAME AND FORTUNE. It’s one of the newest books on the subject and really gets into both the creative and business sides of the profession in a fun and informative manner.